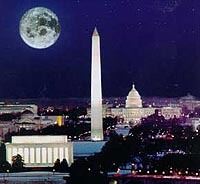 Can anyone tell me where is the best spot in the DC area to take the attached picture? I know it's probably taken from somewhere in Arlington. Does anybody know specific details on how to get to that view ? It looks like it may have been taken from around the Iwo Jima monument. This is taken from a building in Arlington. The Iwo Jima Memorial would be to low. So, is there anywhere accessible to the public to take that view ? That's looking pretty much south to north with the main part of Arlington to the west (left)of the shot. Boisman is right, it's higher than the monument and a little to the east. There is a rise up from JFK's gravesite they may give that view. I took a shot like that many many years ago but I think I was nearer the Iwo Jima. If I could remember street names, I'd try tio direct you to some apartments near there that could be high enough. I used to live in Arlington and my son was just stationed at Ft. Myer, but I can't help with the streets.